By Carl Bradley, University of Kentucky; Daren Mueller, Iowa State University; Damon Smith, University of Wisconsin-Madison; Shawn Conley, University of Wisconsin-Madison; and Kiersten Wise, University of Kentucky. Seeds affected by Phomopsis seed decay can be cracked, shriveled, and have a chalk-white color on the seed surface (Figure 1). Seeds affected by Purple seed stain are covered in purple blotches, or the entire seed may be purple (Figure 2). More information about these diseases is available in the Crop Protection Network (CPN) publication Soybean Disease Management: Pod and Stem Blight and Phomopsis Seed Decay (CPN-1007), available at cropprotectionnetwork.org. Figure 1. Symptoms of Phomopsis seed decay on soybean seeds. Courtesy Travis Faske, University of Arkansas. Figure 2. Symptoms of purple seed stain on soybean seeds. Courtesy Travis Faske, University of Arkansas. 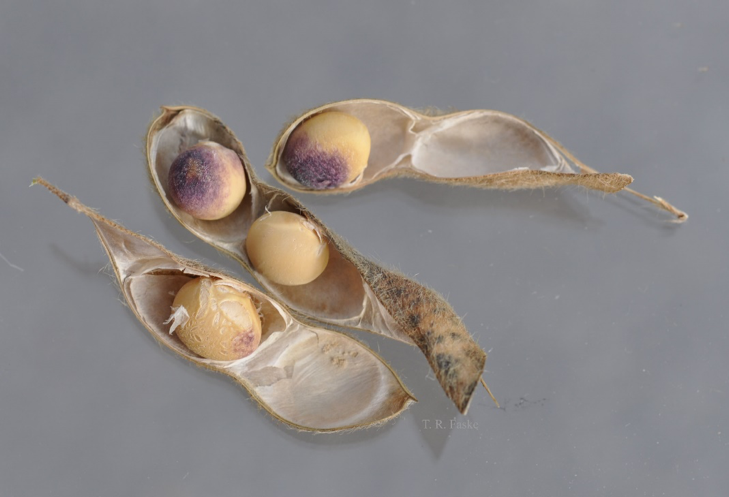 While some areas harvested high-quality soybean seed in 2018, many U.S. seed suppliers have reported that soybean seed for the 2019 crop is frequently testing positive for the Diaporthe fungus that causes Phomopsis seed decay. This is resulting in lower than normal seed germination rates, and could translate to lower than average germination rates in 2019. While it is impossible to predict 2019 soybean planting conditions, if soil conditions are wet and cool during planting, then it is likely that both seedling survival and plant population will be diminished in fields planted with low-quality soybean seed. This means farmers need to decide now on how to manage low-quality soybean seed to minimize the impact of poor seed quality, low germination, risk for reduced stands, and lower yield in 2019. Step 1: Clean Seed if Possible Soybean seed producers who have seed cleaning equipment at their disposal should clean their seed lots to obtain lots with less than 20 percent damaged seed. This will reduce the amount of damaged seed that you plant and create uniform lots that can be tested for germination. Step 2: Check Germination Percentage Before Planting and Adjust Seeding Rate Farmers should check soybean seed germination now and again before planting, because time and storage method can influence germination. Controlled winter seed storage may increase germination rates, because under dry storage conditions, the Diaporthe fungus will die, improving seed quality. We suggest that farmers dry-store their low-germination seed lots over winter and re-test the seed in February. Conversely, poor or wet storage conditions can reduce germination rates of poor-quality seed even further. You should adjust seeding rates based on actual percent germination and yield potential. There are several national laboratories that can test the germination rate of seeds and determine the incidence of infection of certain fungi (including those causing Phomopsis seed decay). Contact your local extension office for help in finding testing facilities. Step 3: Use Percent Germination Results to Help with Fungicide Seed Treatment Decisions Knowing the germination rate and incidence of fungal infection close to planting can help you decide whether to use a fungicide seed treatment. Remember that severely infected or moldy seed will fail to germinate even after being treated. According to Iowa State University research, appropriate seed treatments can increase seed germination rates in poor quality seed by 10-15 percent. Also remember that seed treatments vary in their efficacy against seed diseases, so you should select your seed treatment be based on the diseases present on the seed and the past history of seedling diseases in the field you are planting. For more information, see Soybean Disease Management: Fungicide Efficacy for Control of Soybean Seedling Diseases (CPN-1020), available from the Crop Protection Network, cropprotectionnetwork.org. 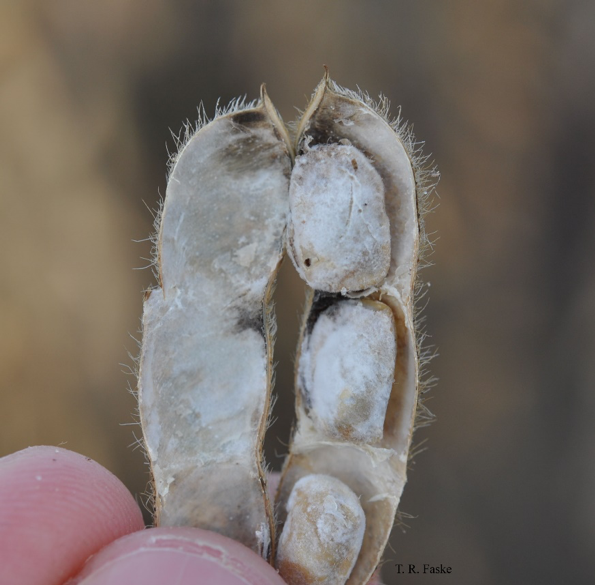 Step 4: Prevent Poor Quality Soybean Seed in 2019 While most of the factors that contributed to poor quality seed in 2018 were beyond our control, there are steps that seed producers can take to reduce the impact of seed diseases in 2019. Foliar fungicides can be inconsistent in reducing Phomopsis seed decay, but applying fungicides at R5 (beginning seed) may reduce seed infection, especially in seed production fields. Keep in mind that although fungicide applications may reduce disease and improve seed quality, they may not affect yield. For more information, see Soybean Disease Management: Fungicide Efficacy for Control of Soybean Foliar Diseases (CPN-1019), available from the Crop Protection Network, cropprotectionnetwork.org. Timely harvest will also reduce soybean seed issues in 2019. Prolonged wet conditions after maturity are favorable for the fungi that cause Phomopsis seed decay and other seed diseases. The longer that mature soybeans are exposed to wet conditions, the greater the likelihood of seed quality issues. A Note About Diagnosing Soybean Diseases After Maturity In 2019, if you suspect soybean disease issues in a given crop, send samples to diagnostic laboratories before senescence and plant death. This is critical in establishing the cause of any disease issues. After soybean plants have matured in the field, many organisms begin to grow and colonize these plants, including fungi that cause soybean diseases. However, once plants die, these fungi could be simply feeding on dead plant tissue and may not have caused a disease when the plant was alive. This can present a major challenge for diagnosticians trying to accurately determine if disease was a problem on submitted plant samples. Common soybean fungi that diagnosticians can find almost every year on soybean plants that have been dead for several weeks include species of Diaporthe (causal agents of stem canker and pod and stem blight), species of Colletotrichum (causal agents of anthracnose), Macrophomina phaseolina (causal agent of charcoal rot), species of Fusarium (many of which do not cause soybean disease, but some can cause Fusarium root rot), and species of Alternaria (generally not considered problematic on soybean). Scouting fields before maturity and submitting samples for diagnosis prior to senescence will help farmers and seed producers know if diseases are affecting soybean yield and seed quality prior to harvest. This knowledge can help you make more effective disease management decisions (such as variety selection). The information provided here is only a guide, and the authors assume no liability for practices imple­mented based on this information. Reference to products are not intended to be an endorsement to the exclusion of others that may be similar. Persons using such products assume responsibility for their use in accordance with current manufacturer instructions. Crop Protection Network programming is available to all. Associated partner institutions are EEO employers and adhere to Title IX and ADA.